This page includes a recipe and tips for cooking American lobsters. 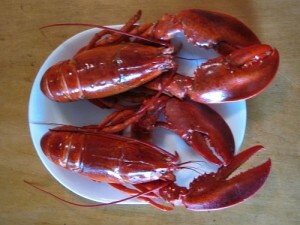 Wash lobsters, but do not allow them to sit in fresh water. Before boiling, euthanize lobsters by inserting a large knife thru the head. A general rule for cooking time is 7-10 minutes for the first pound and 2-3 minutes for each additional pound. Fill water in large pot 3/4 full. Add 1/2 cup salt per gallon of water. Bring to rapid boil. Euthanize lobsters and carefully put in boiling water. Boil until done (see prep notes). Open tails and crack claws.